1 » Former Florida Gators cornerback Janoris Jenkins, whose career hangs in limbo as he decides whether to try his hand at the NFL via the Supplemental Draft, another professional league or another college, is leaning toward the latter choice according to Len Pasquarelli of CBS Sports. Two sources told Pasquarelli that Jenkins will likely transfer to a non-Division I school in order to paint himself in a better light before the 2012 NFL Draft rolls around. “It’s about 50-50 right now that he tries to find a [college] to play and convince scouts that he’s really serious about an NFL career,” one of Pasquarelli’s sources told him. 2 » With offers from a number of other top-tier institutions, one of the best women’s basketball recruits in the state of Kentucky decided to commit to Florida on Monday. Sydney Moss, the daughter of NFL wide receiver Randy Moss, will sign with the Gators in November. She chose Florida over Kentucky, Kansas, Louisville, West Virginia, Dayton, Xavier and UCLA and averaged 22.6 points and 10.8 rebounds per game as a junior in high school. TWO BITS: Pounceys together? 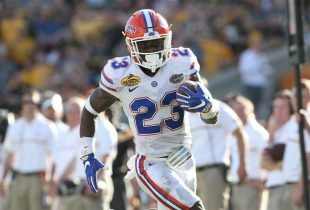 Jenkins to NFL? Can never go wrong with a recruit named Randy Moss. Great pickup for our girls team! I hope that things work out for Jenkins and he rights his mistakes. I don’t think he is a bad guy but just made some bad decisions. He should go play for North Alabama (think that is the name) where Terry Bowden coaches and has accepted FSU’s wayward players. Although it may not be the most apealing choice to transfer for jenkins senior year..in the long run he will be saving millions and avoid the lock-out drama that is the NFL..
Hey Adam, I hear we are in the running (the favorite even?) for a beast of a tight end announcing tomorrow. Anything new on that? Yes…basically what you just said. Florida is in the final two. Will have a story tomorrow when he announces.